I absolutely love this picture I managed to capture right after a picnic. I’ve already talked about all of the colorful flowers you’ll see if you take a walk through London in the spring, but there’s so much more than gardens to admire on a stroll through this iconic city. Here are a few more of my favorite things that I saw in London. 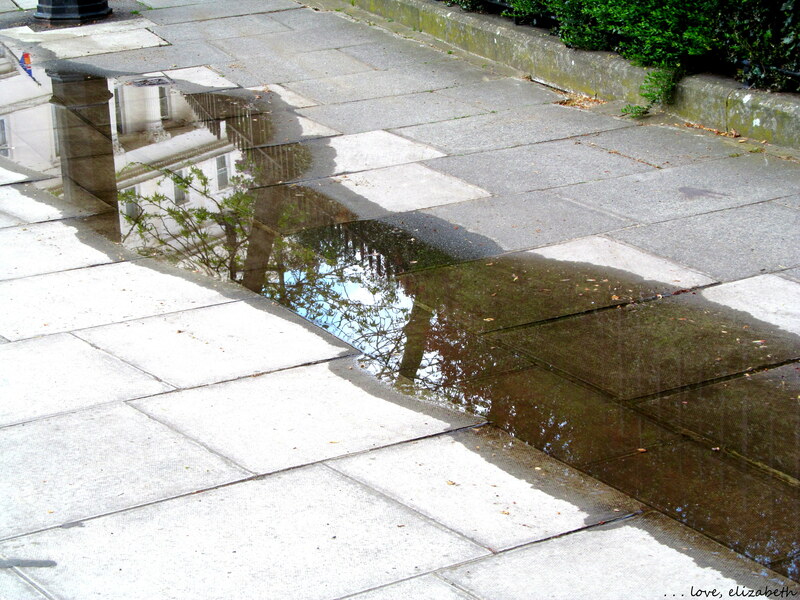 It rarely goes more than a few days without raining in London, and I always find myself completely mesmerized by the reflections that appear in the post-rain puddles. I saw this one almost as soon as I got off the bus, and as I got out my camera, I knew I wouldn’t be putting it away until I got on the bus back to Birmingham. I found this one almost immediately after arriving in London. 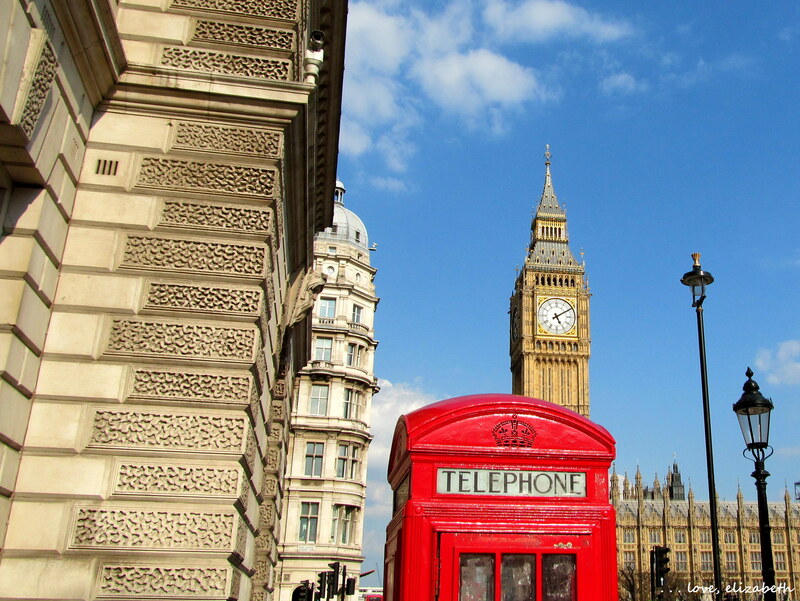 Another thing you won’t go long without seeing in London is an iconic red telephone box. These things have been overused on postcards, merchandise, and every imaginable piece of English-themed memorabilia, and yet they’re such an essential part of the London experience. They are still in operation and a quick phone call to the US costs slightly more than a dollar. While there’s a stereotype of the British being cripplingly modest, I always found a healthy dose of national pride that manifested in things like the UK’s flag hung in and around pubs, markets, and public squares. You never have a chance to forget what country you’re in, and I love that, especially since the flag is such an attention-grabbing image. “How very British!” is a phrase that Molly and I have exclaimed a lot during our various trips to London. The patriotism that London radiates is infectious, and everything from the flag to the phone boxes to the fish and chips makes me love the country as if it were my own. 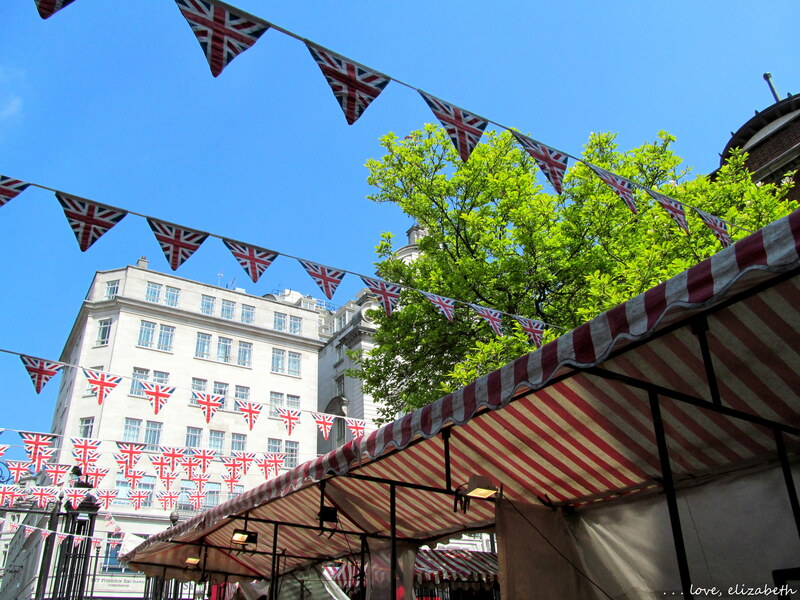 Walking into this small market covered in banners was a how-very-British moment. 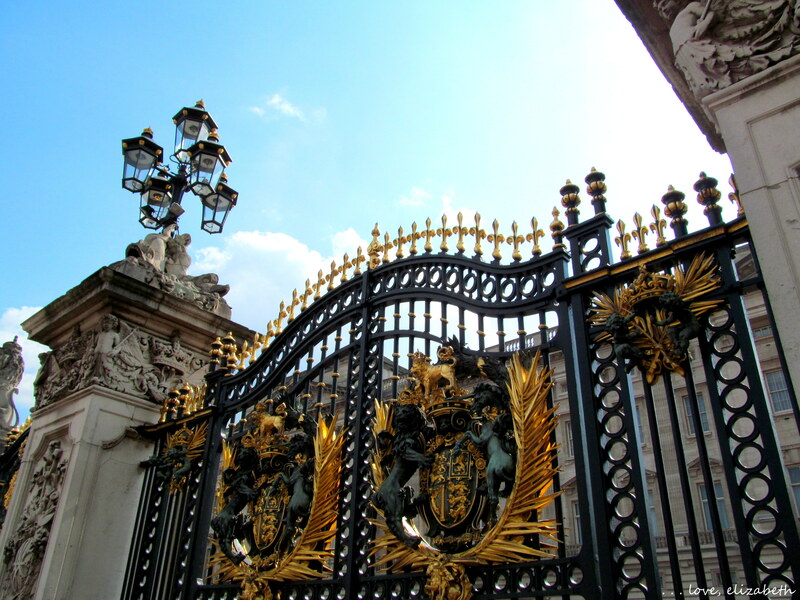 Buckingham Palace is always a must-see during a trip to London–if not for the Changing of the Guard, then definitely to admire the lavish architecture. I still haven’t had a chance to see the inside of the palace, but judging by the exterior, I can imagine the rooms are elaborate and full of stately details. Every time I visit London, I end up with even more photos of these ornate gates. 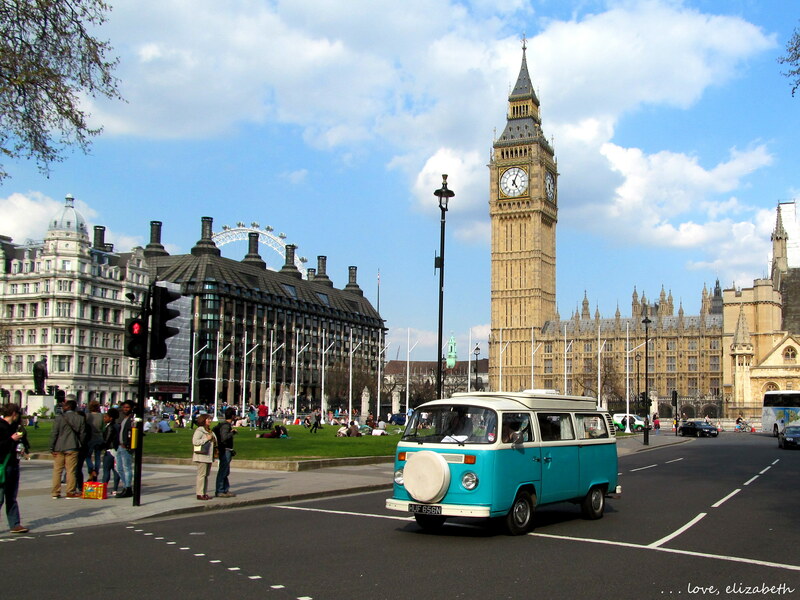 Some other London icons are Big Ben, Parliament, and Westminster Abbey. Their location makes them perfect to see during a walk along the River Thames, which is one of my favorite free activities in London. Strolling along the river is a great way to take in some of the city’s sights (start your walk at the Tate Modern and walk to the Tate Britain if you want to take in some museum culture as well—both museums are free, and your walk will take you along the river and past Parliament and the London Eye) and enjoy some very interesting people-watching. There’s also a great grassy square next to Parliament, which makes it a great stopping point for a picnic. 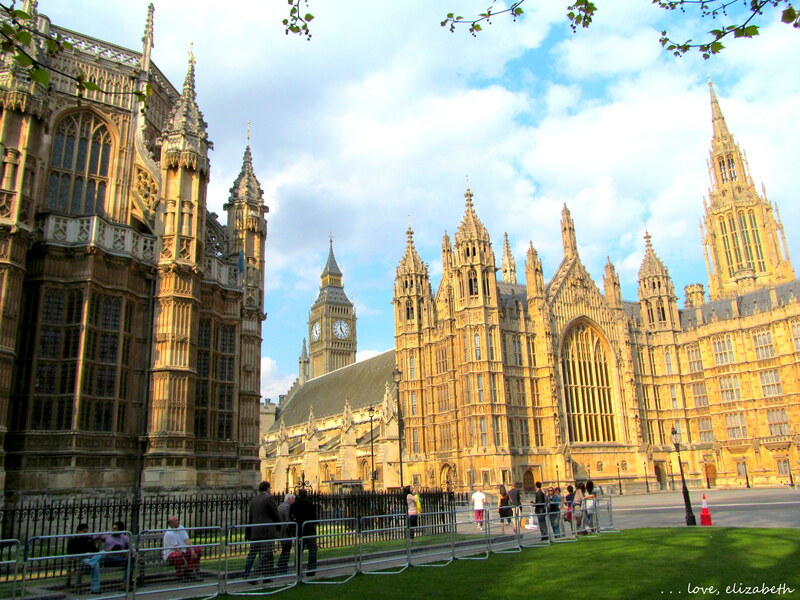 After about a dozen trips to London, I still can’t get enough of these elaborate buildings. The West End is London’s equivalent of Broadway, with many musicals and shows to choose from. 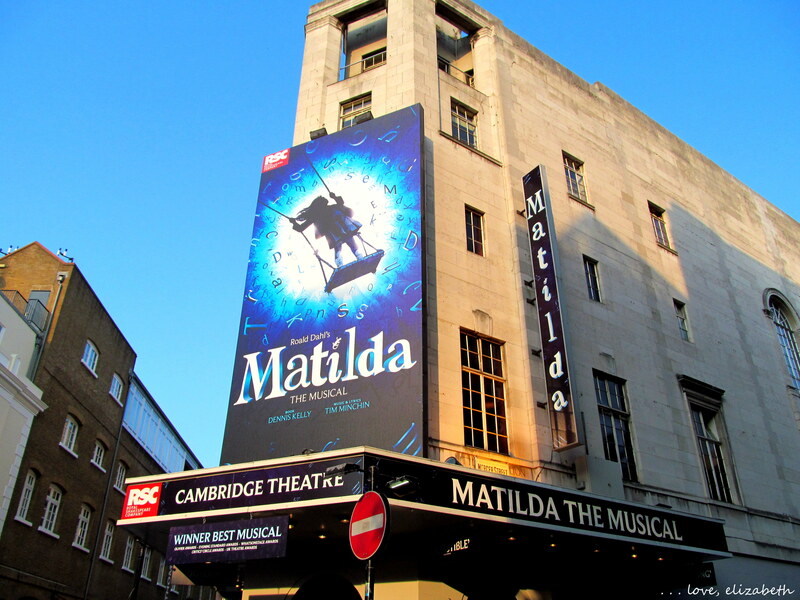 Molly and I started our first morning in London with a walk through the West End; we decided to see “Matilda the Musical” this time and arrived at the box office early in the morning so we could get the discounted student tickets. The show itself was great, and we had a blast making friends with the other students who were waiting in line for cheap tickets. At five pounds per student ticket, “Matilda” was a great way to stick to our budget while getting a little bit of high culture and making some new friends to discuss the play with. And while London boasts world-renown museums, critically-acclaimed musicals, and majestic architecture, there are plenty of interesting artsy spots to be found around the city, too. Camden, full of colorful houses and several different markets, is a great neighborhood to find colorful culture. Sometimes I dream of living in London so that I can fill my house with funky furniture and kitschy trinkets. 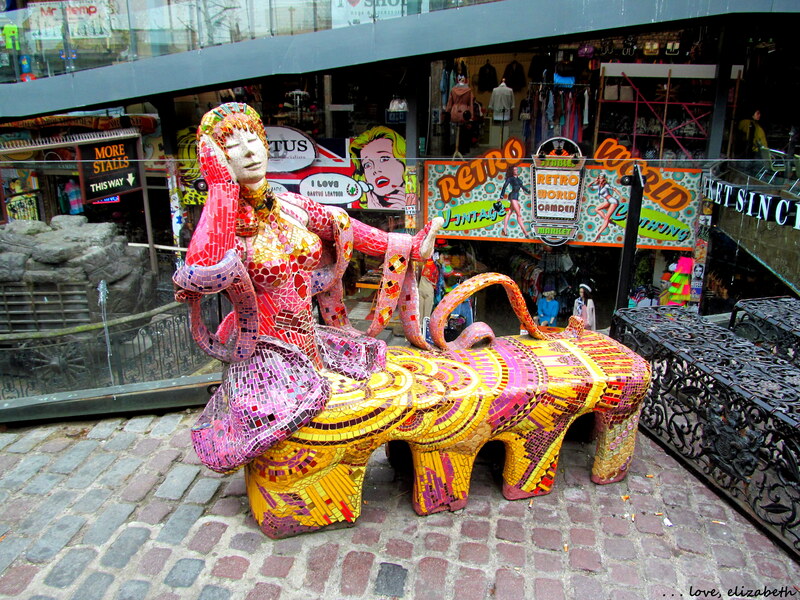 The Stables Market is one of my favorite places in London and is full of interesting touches like this mosaic bench. There’s obviously so much more to do in a city as big and diverse as London, but these are the places that I chose to highlight during my short stay this time. And next time I’m back in the city, I know I’ll discover even more! All of these photos have beautiful composition, you really have a good eye! Also, I’ve been to London but I’ve never seen the Stables Market- all the more reason to go back, thanks for sharing!